At CES this year, Sony’s press conference distinctly lacked any major new announcements. Instead, the focus was on its ambitious plan to link high-quality video and audio tech. 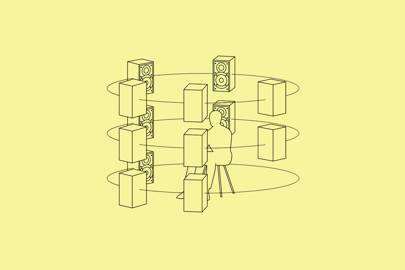 In practical terms, this means using multiple speakers surrounding the listener to distribute individual sounds from the same piece of audio across a space, and “throwing” them in different directions. This is called “object-based spatial audio”, because the listener can perceive the spatial distribution of tracks as they play. Another way to picture it is to imagine what it would be like to feel like you are inside of the scene that you are watching or listening, rather than in front of it. To do that, Sony is using the MPEG-H 3D audio format, a standard audio format that supports multi-channel encoding/decoding on up to 64 loudspeaker channels and 128 codec core channels. In addition, the company is announcing an app to bolster the experience: based on a home-made inner ear diagnosis, carried out from a picture of your ear that you can take and send with your phone, it claims that it will deliver sound that is tailored to the listener’s particular hearing characteristics. Something between Snapchat and HRTF, or so it seems. Sounds a bit too good to be true, and not scientific enough? We’ll have to wait and see – Sony has not yet given the exact details of how it plans to bring audiology to your phone. A new Sony-controlled premium audio format is on its way to take over the entire chain of music creation – at least that seems to be the company’s plan for the future. Dolby Atmos and DTS:X may have to start watching their backs. Where Sony can differ from Dolby Atmos or DTS, however, is in the quality of the sound it delivers. And of course, it is thinking at the consumer level, too; different ears, indeed, want different things. During the show, the company measured the hearing characteristics of listeners before starting the new technology’s demo, to customise the mapping of sound to each individual. And it announced that it is working on miniaturising the process so it can be carried out directly from customers’ phones. An app that lets you take a picture of your ear and work it through its software to tailor soundtracks to your specific hearing preferences is also allegedly coming. Prices and details of a launch date are yet to be released, but, in addition to streaming platforms, Sony has already secured partnerships with industry names including The Wombats, Kodaline or AJR. Much more needs to be done, however, before the music business can be seen to be “on side” with the new technology, which will be key to winning over consumers and Sony being able to deliver on its promise of bringing a “live concert experience” to your living room.